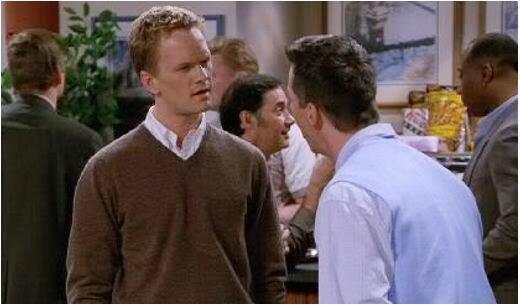 In May of 2000, an episode of Will & Grace aired in which one of its gay characters, Jack, joins an ex-gay ministry in an effort to get close to, and seduce, its formerly gay leader, Bill (played by Neil Patrick Harris). Unsurprisingly, the ex-gay community — people who claim to have suppressed or sometimes even "cured" their homosexuality — weren't depicted in the best of lights. 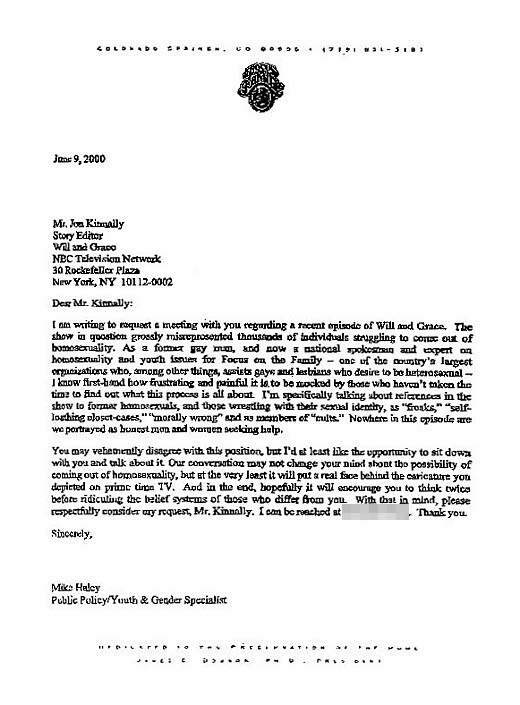 Shortly after the episode was aired, the show's story editor, Jon Kinnally — himself a gay man — received a letter of complaint from Mike Haley, a "former gay man" and Youth & Gender Specialist at Focus on the Family, a Christian organisation which actively promotes sexual orientation conversion therapy. 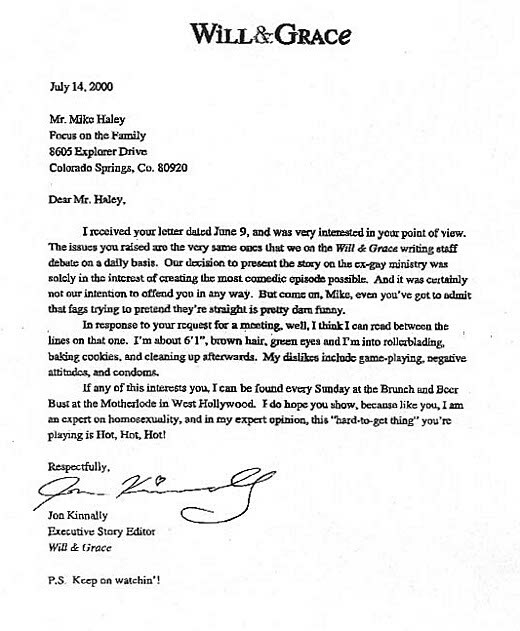 His letter and a response composed by the Will & Grace staff, both of which were subsequently published by an infuriated Focus on the Family, can be read below. When later questioned about the matter, Jon Kinnally said, "What [Focus on the Family] are doing is reprehensible, wrong, and fear-based." Transcripts follow. Apologies for the image quality. I am writing to request a meeting with you regarding a recent episode of Will and Grace. The show in question grossly misrepresented thousands of individuals struggling to come out of homosexuality. As a former gay man, and now a national spokesman and expert on homosexuality and youth issues for Focus on the Family — one of the country's largest organizations who, among other things, assists gays and lesbians who desire to be heterosexual — I know first-hand how frustrating and painful it is to be mocked by those who haven't taken the time to find out what this process is all about. I'm specifically talking about references in the show to former homosexuals, and those wrestling with their sexual identity, as "freaks," "self-loathing closet cases," "morally wrong" and as members of "cults." Nowhere in this episode are we portrayed as honest men and women seeking help. You may vehemently disagree with this position, but I'd at least like the opportunity to sit down with you and talk about it. Our conversation may not change your mind about the possibility of coming out of homosexuality, but at the very least it will put a real face behind the caricature you depicted on prime time TV. And in the end, hopefully it will encourage you to think twice before ridiculing the belief systems of those who differ from you. With that in mind, please respectfully consider my request, Mr. Kinnally. I can be reached at [redacted]. Thank you. I received your letter dated June 9, and was very interested in your point of view. The issues you raised are the very same ones that we on the Will & Grace writing staff debate on a daily basis. Our decision to present the story on the ex-gay ministry was solely in the interest of creating the most comedic episode possible. And it was certainly not our intention to offend you in any way. But come on, Mike, even you've got to admit that fags trying to pretend they're straight is pretty darn funny. In response to your request for a meeting, well, I think I can read between the lines on that one. I'm about 6'1", brown hair, green eyes and I'm into rollerblading, baking cookies, and cleaning up afterwards. My dislikes include game-playing, negative attitudes, and condoms. If any of this interests you, I can be found every Sunday at the Brunch and Beer Bust at the Motherlode in West Hollywood. I do hope you show, because like you, I am an expert on homosexuality, and in my expert opinion, this "hard-to-get thing" you're playing is Hot, Hot, Hot!